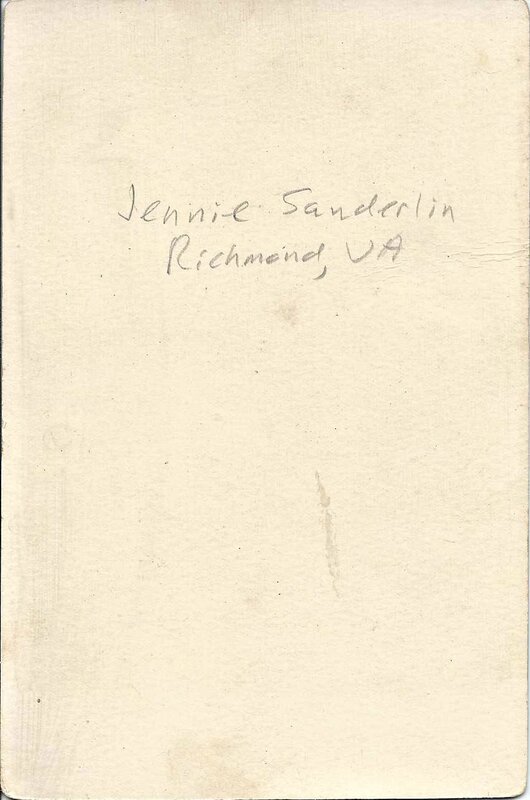 Cabinet photograph of a young woman identified on the reverse as Jennie Sanderlin of Richmond, Virginia. No photographer's imprint. 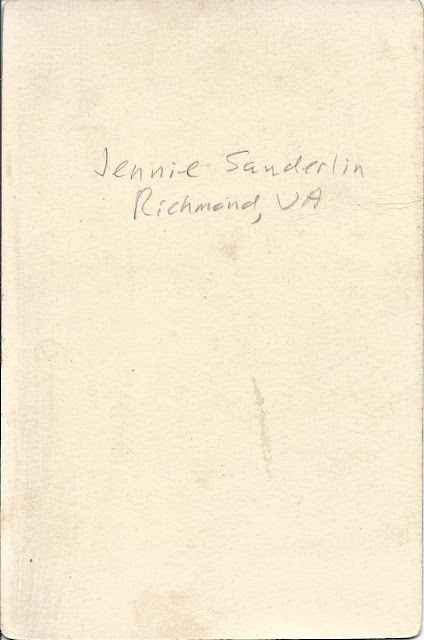 I believe that Jennie Sanderlin was Axie Jane Sanderlin born about January 1869 in North Carolina, the daughter of Dorsey Asa Sanderlin and Claryine "Clary" or "Kate" (Overman) Sanderlin. Dorsey may have been married previously to a Jennie Peacock. I found some interesting information about the Civil War service of Jennie's father Dorsey A. Sanderlin here. He was captured at Cape Hatteras in 1861, sent to Fort Warren in the harbor of Boston, Massachusetts and released in a prisoner exchange in 1862. Jennie's paternal grandfather, also named Dorsey Asa Sanderlin, was a well known traveling preacher in the North Carolina area. Jennie's father's mother was Jane Upton, Rev. Sanderlin's second wife, I think. 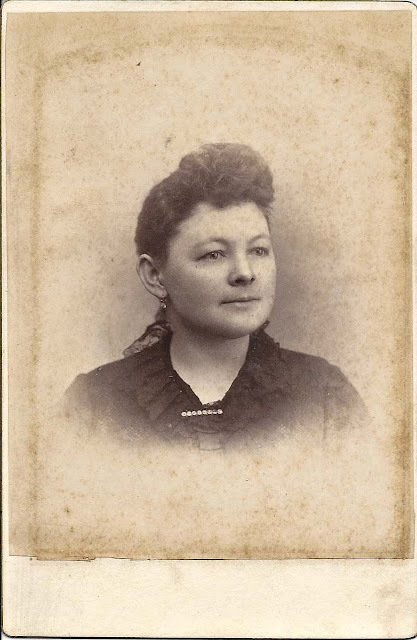 There's a possibility that Jennie married about 1885 and had a daughter Susan born about 1886. In the 1900 Census of Richmond, Virginia, Susan is listed as a stepdaughter of William Henry Peacock, whom Jennie married on 10 June 1891 at Richmond, Virginia. However, it's possible Susan was the daughter of a previous wife of William Henry Peacock. According to the 1900 Census of Richmond, Virginia, William Henry Peacock was born in Maryland about 1861. In 1910 the William, Jennie and their three children were still at Richmond, Virginia. William was working as a painter. Before the enumeration of the 1920 Census of Richmond, Virginia, William was no longer in the picture, most likely as a result of his death, and Jennie was remarried to James R. Allen, who was born about 1873 in Virginia. If you have corrections to the information above or can provide more details on Susan M. Peacock, Claryine Overman, William Henry Peacock or James R. Allen, please leave a comment or contact me directly. Thanks!